Have we got our calibrations for Pinot Noir right? Just how good is SA Pinot Noir? It’s a privilege to embed myself at the Wine Judging Academy organised by Michael Fridjhon every year as some benchmark wines get poured over the three days and it’s a useful way of re-calibrating. One of the flights that attendees of this year’s Academy got to taste included six examples of Burgundy including everything from a Côtes de Nuits Villages 1996 to a Labet & Dechelette Chateau de La Tour Clos de Vougeot Grand Cru 1989, the latter a wine I found entirely spellbinding. Yesterday, lunch with Peter Finlayson of Bouchard Finlayson and a chance to taste various vintages of his Pinot Noir, including both the current-release Galpin Peak 2013 and Tête de Cuvée 2012. The former of course is rated 5 Stars in Platter’s 2016, equivalent to a score of at least 95 on the 100-point scale which I think elevates its standing in the world of Pinot Noir a little too much. It showed well yesterday, the purity of fruit particularly striking, and I was inclined to think that my rating of 89 points last year was unkind, 91 being fairer. Tête de Cuvée 2012 originally also rated 91 on this website and I think that’s pretty much spot on. 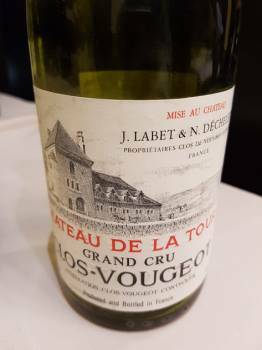 This wine typically has more new oak than its sibling and the wine can feel a little less perky in its youth but I think too often we treat Pinot as necessarily light and delicate whereas the very best like the Clos de Vougeot above often have plenty of reined-in power. This, I think, also applies to the Tête de Cuvée which tends to mature better than Galpin Peak. We need to allow for more than one style of Pinot going forward.